My brother and his family came to visit last Sunday so I did what I always do when family come up — I made a super-duper cake. However, this had to be a special super-duper cake. My brother’s wife Val can’t have dairy or gluten; they make her really ill. So the search was on to find a dairy-free gluten-free cake. This is surprisingly difficult; most cake recipes are one or the other, but I couldn’t find one for both. Eventually I found a Dairy-free Carrot Cake on (Where else?) the BBC Good Food Cake iPhone app that could be made gluten free just by using gluten free flour instead of regular flour. It’s called “Yummy scrummy carrot cake”, and it certainly lived up to its name. I adapted it slightly (I used lemon instead of orange because Val gets migraines if she has oranges) and didn’t add the raisins, so although it’s based on this recipe I’ll post the recipe I actually used. Preheat the oven to 180C and get your cake tin. The recipe said to use an 18cm square cake tin, but I don’t have one of those so used my normal round tin. As it’s a dairy-free recipe you can’t use butter to grease the sides. The best thing I can recommend is Fry-Light. 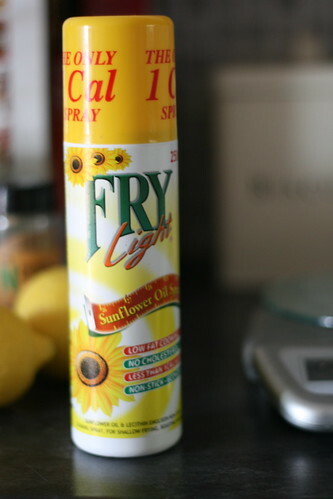 I use it in all my cooking where I need fat or oil; it’s less than one calorie per spray, does the exact same job as oil or butter and is really easy. It comes in all sorts of flavours depending on what you want to cook. For baking I usually use the butter one, but we were out of that so I used sunflower. Okay, so spray Fry-Light all over the cake tin until the sides are well greased. Then you can start mixing your cake. Tip the sugar into a bowl, beat the eggs and add them in, and finally pour the oil in. 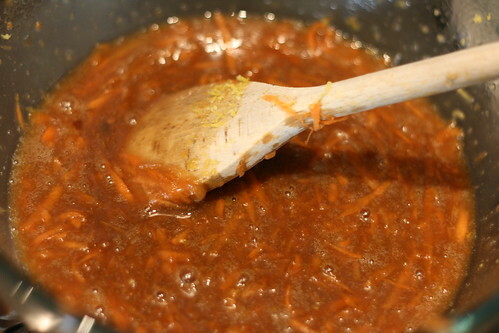 Mix it together until combined (It should look like this) and then grate your carrots and your lemon zest. I used a fairly wide grater for the carrots and a smaller one for the lemon. You can use the same for both, but I absolutely hate grated carrot (or in fact carrot full stop unless it’s in a cake) so I wanted it over as soon as possible. Grated carrot is slimey and totally unappealing; the process of grating it is messy. You will get carrot all over your kitchen. You will be finding it, as I am, a week later hidden in crevices. You have been warned. 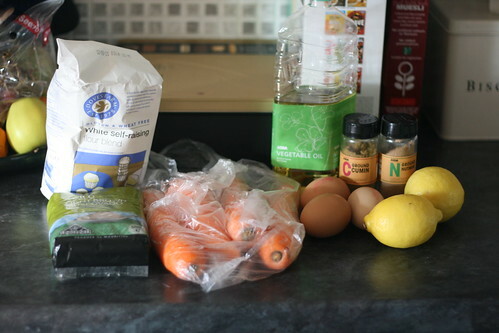 But when you’re done, stir the carrots and the lemon zest into the mix. Sift the flour into the bowl and then add the nutmeg and cinnamon. 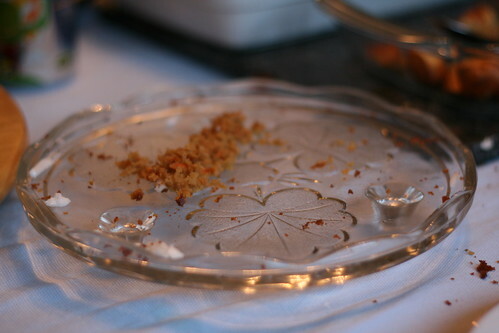 I don’t really like nutmeg but added it anyway, thinking that if I didn’t want it I could eat it; if you don’t like nutmeg, add it anyway because in the final cake there was just a subtle and rather lovely hint of spice. Mix everything together — the recipe didn’t specify folding but I ended up doing half folding and half normal mixing — pour it in your cake tin and bake in the oven for about 40-45 minutes. The top should feel firm. It’s not like a normal cake texture, I found; I poked the top and it came back up, but not quickly. It feels a little moister, a little richer. This is because it is moister and richer than most other cakes I have ever eaten. Leave it to cool and mix the icing when finished. I just kept squeezing the juice into the icing and mixing with a fork until it was runny but still thick. 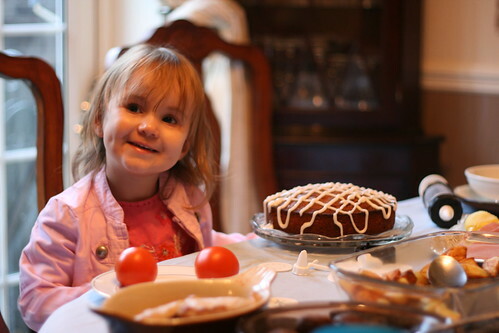 Then do as the recipe says — “set the cake on a serving cake and boldly drizzle the icing back and forth, letting it drip down the sides” Not sure how bold my icing was considering I was being helped by an utterly adorable 3 year old, but it looked nice. 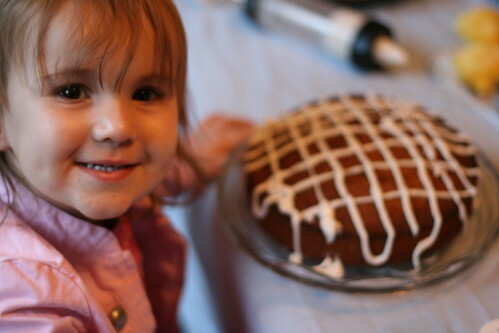 She was awfully pleased with that cake icing. And she was awfully cute. I iced it using a new toy I picked up in TK Maxx for a fiver. I’ve never used it before so it was a bit of an experience. It seemed to work okay, apart from the nozzle getting clogged up a few times. That was totally my fault though — Sammy and I squeezed the juice from the lemons into the icing and the pips kept falling in. Pips + icing nozzles don’t work together very well. However, when it worked properly it worked really well. I’m excited to be able to use it again, actually. Yes, I did just use the word “excited” about a cooking implement. Sigh. Anyway. 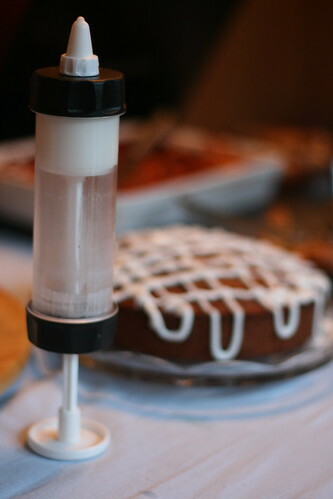 …and Val was happy with it, so much so she extolled the virtues of the cake all over Facebook and asked for the recipe. So, hi Val! Please make this cake. It really is delicious and it’s so easy. You won’t regret making it. To see photos from the cake-making, there’s a Flickr photoset here.